An adult Christopher Robin, who is now focused on his new life, work, and family, suddenly meets his old friend Winnie the Pooh, who returns to his unforgotten childhood past to help him return to the Hundred Acre Wood and help find Pooh's lost friends. Movie in English with subtitles in Latvian and Russian. Paddington, now happily settled with the Brown family and a popular member of the local community, picks up a series of odd jobs to buy the perfect present for his Aunt Lucy's 100th birthday, only for the gift to be stolen. 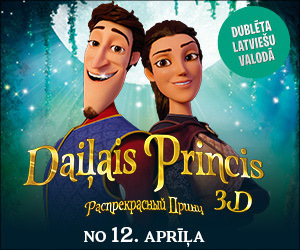 Movie dubbed in Latvian and Russian. Several shows in English (without subtitles).